Hello and seasons greetings to you all! On this festive morn the Duke and Duchess of Cambridge joined a procession of royals for the annual Christmas service at St. Mary Magdalene Church. William and Kate were beaming as they made their way to church following what was undoubtedly a very exciting morning with Prince George, now two-and-a-half, excitedly opening his gifts and celebrating Princess Charlotte's first Christmas. 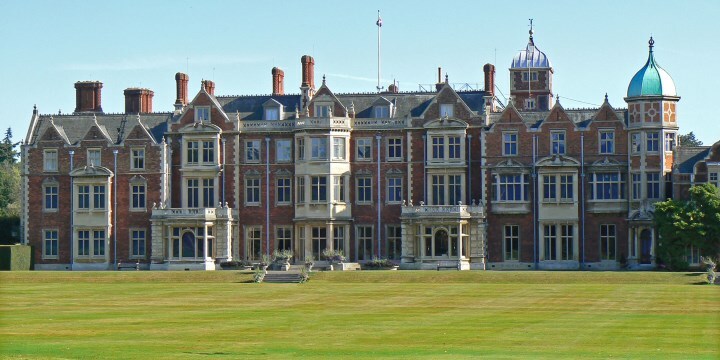 It's a packed year at Sandringham with an estimated thirty royals enjoying the festivities at the Norfolk estate. Members in attendance include Prince Charles and the Duchess of Cornwall, Prince Harry, the Wessexes, the Yorks and the Princess Royal and her husband Timothy Lawrence. It offers a splendid opportunity for them all to unwind and enjoy some quality time together. 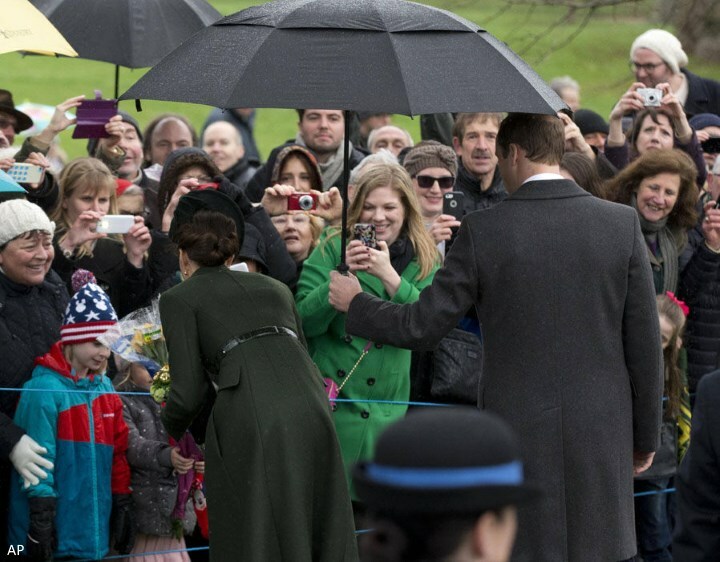 William holding the umbrella over Kate. 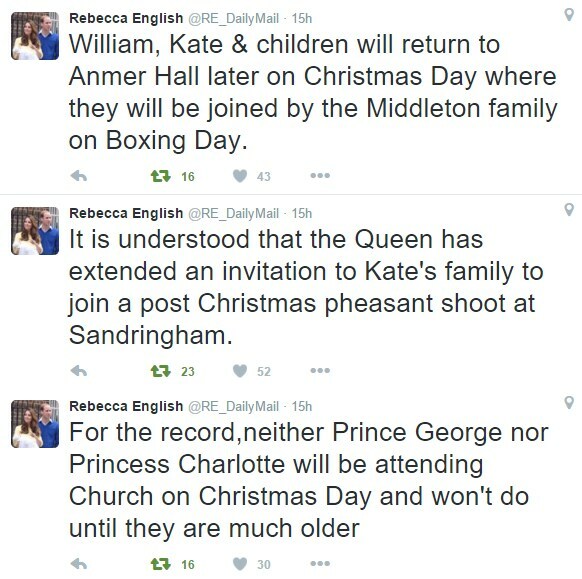 Rebecca English elaborated further on festive plans including news Her Majesty has reportedly invited the Middletons for the annual Boxing Day shoot. The family are expected to stay at Anmer Hall for a few days. 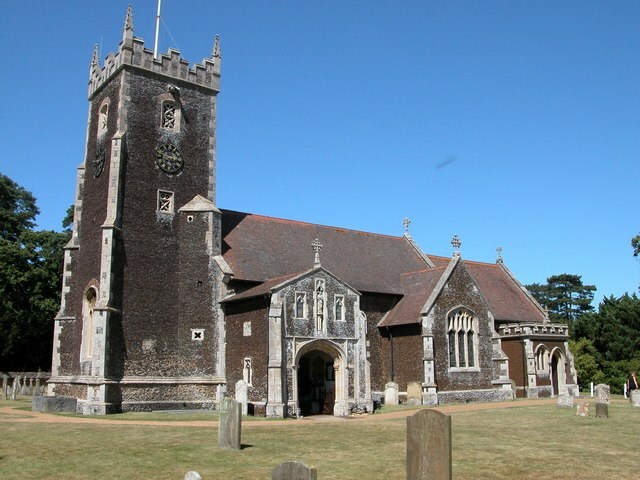 The parish Church of St. Mary Magdalene is both picturesque and steeped in history, with memorials to many members and relations of the Royal family, from Queen Victoria onwards. It is considered one of the finest carrstone buildings in existence, and dates back in its present form to the 16th century. We last saw the Cambridges at the church for Princess Charlotte's christening in July. A lovely shot of William and Kate. After the forty-five minute service the royals chatted with locals. William and Kate exchanged Christmas wishes and chatted with well-wishers. The Queen looked regal in red. Members of the royal family chatting outside the church. Upon their return to Sandringham House it will be a change of clothes followed by a traditional Christmas lunch of Norfolk turkey with all the trimmings. At precisely 3 pm the family gathers round to watch the Queen's Christmas speech. In the afternoon, they reportedly often take in a stroll on the majestic estate. Tonight, the last ever episode of Downton Abbey airs, and William recently revealed "Downton is one of my and Catherine's favourite programmes". I expect they will be very eager to tune in. The Duchess wore a new coat by Sportsmax today (with thanks to Ashley for the speedy ID). 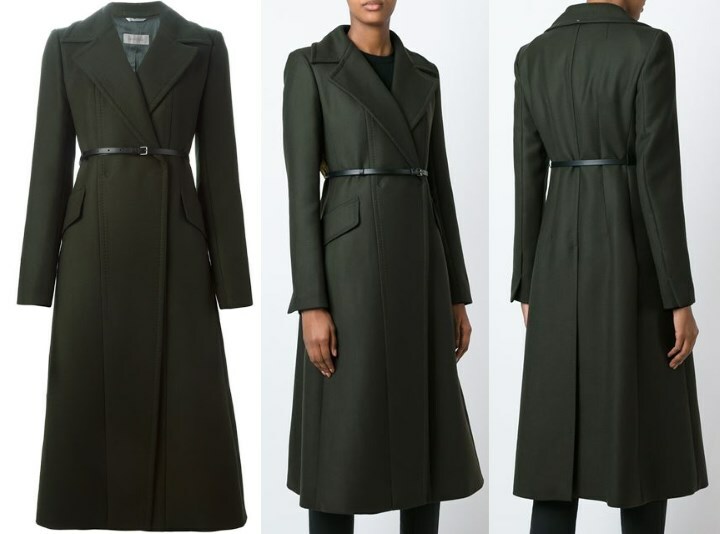 The Long Belted Coat is made of green virgin wool - a very festive and appropriate colour for the day. At present, it is reduced from $1805 to $1231 at FarFetch. 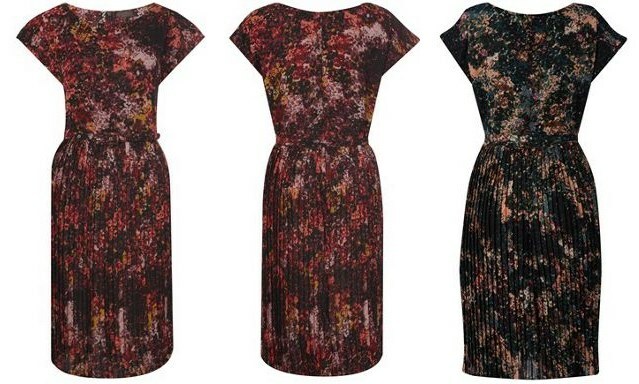 Underneath Kate wore the very pretty Great Plains Cézanne dress. Kate wore the dress in "Winter Pink" for a 2013 visit to Grimsby. The brand is part of the French Connection family - another label the Duchess is fond of - and offers stylish clothing at affordable prices. 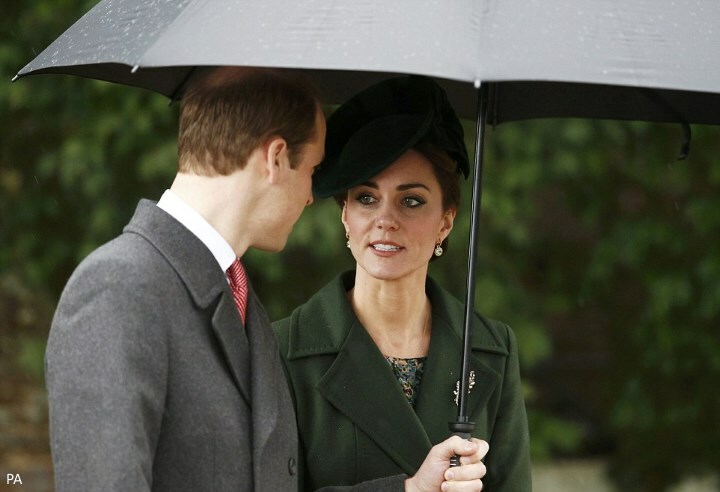 Several readers noted Kate wore the dress in another colourway, 'Pine Needle', today. We see both versions of the dress in the graphic below. The Cezanne is described as "a printed tunic dress with a boat neck, short sleeves and a pleated skirt". It is 100% polyester and originally retailed for £75. It's a great dress and one I hope we see in its entirety in the future. 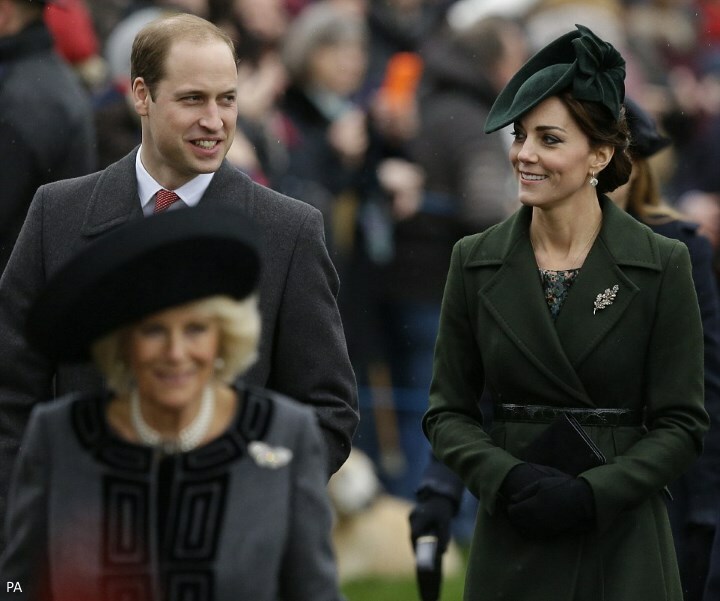 A look at Kate's rich green hat which was complemented by an elegant updo. Kate selected her Aquatalia Rhumba boots. Kate carried her Mulberry Bayswater clutch in black suede. One of the talking points regarding Kate's look today has been a very striking brooch she wore. 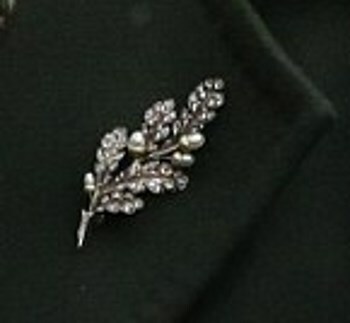 The eagle-eyed Anna noted Kate first wore the Acorn Brooch for the Diamond Jubilee Luncheon in 2012. It is believed the piece is a gift the Duchess may have been given for her wedding or perhaps from her parents. 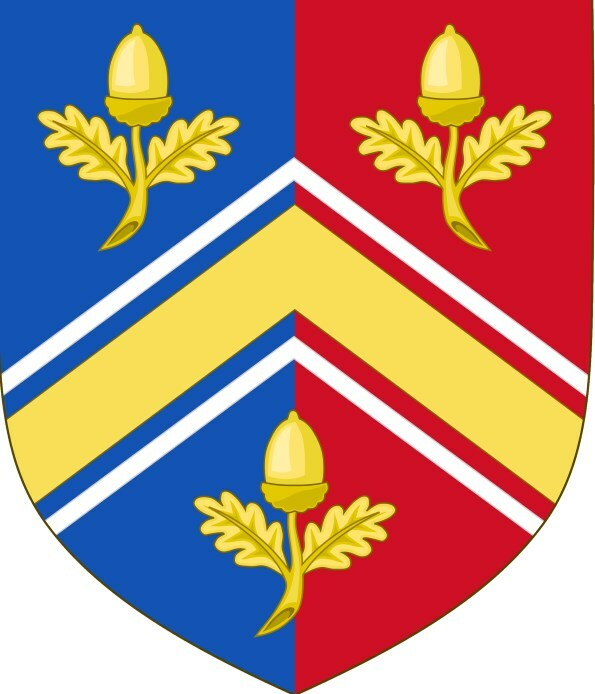 The Middleton family's coat of arms features three acorns representing their three children. They were chosen because the area in which the children were brought up, West Berkshire, England is surrounded by oak trees. Additionally, oak is a long-established symbol of both ‘England’ and ‘Strength’. 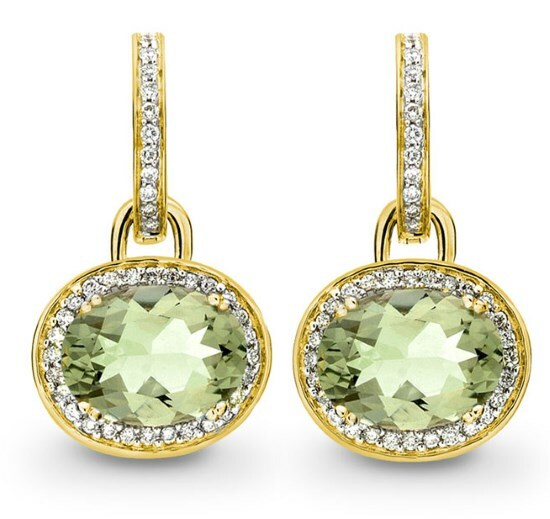 Kate accessorised with her Kiki McDonough Classic Green Amethyst Diamond Earrings. It was a lovely ensemble for the Duchess, filled with beautiful pieces which made for a very seasonal look when worn together. You can watch a video at The Telegraph. The Queen's Christmas Speech is now available to view at YouTube. It begins with a selection of images featuring highlights of the year including Prince George's appearance at Trooping the Colour and Princess Charlotte's christening (you'll notice one of the christening portraits beside HM). Her Majesty references her upcoming 90th birthday celebrations, saying: "I look forward to a busy 2016 though I have been warned I may have 'Happy Birthday' sung to me more than once or twice". The Queen reflected on the pain those who have lost a loved one this year may be experiencing and referenced the darker events of the year, adding: "It is true the world has had to confront moments of darkness this year". We'll be back with our Year in Review post as well as our end of year polls next. All that remains is to wish you and your loved ones a Very Merry Christmas! Besides her husband, Timothy, Princess Anne's family did not attend the Church service, they are likely celebrating with their in-laws this year. Ok.. WOW! Kate is looking AMAZING! I looooove the hat! Great to see that brooch again! I'm usually one of those who says "brooches are for older people" but in this context it just looks retro! Same with the hat and hair. I'm not in the Updo-brigade but I have to say it gives a nice flair to these kind of looks! I wonder if the hat is Sylvia Fletcher for Lock and Co. It reminds me of some of her previous stuff we've seen on Kate. Thank you so much for your tireless work Charlotte and a special Marry Christmas to you and the Mr! That was my opinion also about the brooch. My grandmother always taught me that brooches were women age 40 and up. But it looks great with that coat. I'm the same age and I have a few brooches from my grandmother. And it is indeed very hard to find clothes they fit with. I never understand all the "this coat needs a brooch" that shows up in commentsections all the time (not here that much) :P Guess it's a generational thing, just how the Queen Mother felt undressed if she didn't have a hat on. I have brooches also and you are right, finding the right outfit for them takes some effort but it is so worth it. They bring beauty and cheer to people. With Kate it's retro and with anyone else it's "older". Good to know, Becks! :) I think it's the way you wear them, personally. I've stuck them on hats and coat collars -- once on a cuff -- and every time I go I get lots of compliments. If you wear them like grandma (or the Queen) they look frumpy. I've got pins and brooches, and they all go on the outside of a dull colored coat. Some of my favorites are my mother's and grandmother's incredibly gaudy (and really pretty ugly if you look at them from an aesthetic point of view) ones from the 1950s, but they look awesome on a black coat! What, bluhare? WHat on earth in my comments made it sound like it's only on Kate? I meant that all the time people yell about brooches (Usually on a lapel) I think it would look frumpy. But in this more historical context and the styling I think it fits. Same as you, I think it's about styling! But it is very easy for a brooch to fall into "granny" territory, even on Kate! I was teasing you Rebecca. Oh Bluhare, you and I are ridiculous old brooch-wearing bddies! Just teasing. Almost. Seriously, I love brooches. They weren't particularly fashionable in the 1980's but I wore one on my suit everyday regardless. They are such an amazing way of expressing your personality - I can wear brooches in the shape of my dogs, or of birds, or hearts, or so many wonderful other shapes, they can be paste or real and still add character. To me, saying they are out of fashion or just for pensioners, or for only those over forty is like saying earrings or bracelets can go out of fashion. Why turn your back on such a wonderful means of expression. Kate stands to inherit a magnificent collection from the queen who herself inherited many from her own mother and from even earlier queens. So I say, don't think retro - just go for it - bring those brooches back in fashion as only someone as beautiful and stylish as Kate can do. Lovely to see her wearing such a beautiful one, and one representing the symbol of her family. They can go on blazers, jackets, dresses and coats! There is a wonderful book on brooches - I can't remember its name and I'm not at home but it gives a great history = they are a fabulous thing to collect and wear and I have ones my beloved father gave me and ones from my mum and nana - and I don't care how old biddy I look - I'm wearing them regardless. Yeah, such old biddies in here with your brooches and hair curlers! I hope Kate will start wearing brooches in her hair though, like the Swedish princesses do. Like this brooch would look great on the side of the head, pulling some hair back!! I have to chuckle when I see you young women calling yourselves old biddies :) Bluhare I'm not sure about you, but I remember Julia telling a story of being a young girl looking at a photo of Diana, so I'm guessing 40'ish... Which is a fabulous decade, I guarantee you. I am 54 and will be 55 next summer, and I'm well aware what's after that so I'm not sure I can even jest about being an old biddy anymore, it's too close to reality! My aunt was the royal fan, particularly Princess Margaret, and then always compared me to Diana since we were the same age (no pressure there) but I suppose younger girls are usually the most devoted fans, I think Julia may have actually said that in a previous post. Anyway, back to the knitting! Brooches are on the verge of a big comeback I just know it. If ever people had a larger need for personal represention in the midst of the crowds it is now. Brooches help provide that. And, as was said earlier, they really do bring cheer and beauty to those around. Your oven must be related to my oven. One of the best friends I ever had was 30 years older than me. I met her when I was 23 and she was 53. She taught me a lot, and she had some of the most sage advice going. I remember her one time saying, "bluhare, if you don't want to get old don't hang around with old people!". Even she thought that was pretty funny when she realized she was the old person I was hanging around with! She was one of a kind. It's been three years since she's been gone, and I miss her a lot. That's a long way of saying that I'm going to torture you until I die, Becks!! Am I too old for this blog? Ridiculous question! I may be the age to have been a schoolmate of Carole Middleton had my ancestors not jumped at the chance of new lands 400-odd years ago . . . which makes me older than Julia, bluhare, or Claudia, but I maintain that any age is the right age to be fascinated by other people, including royals. And I second (or third?) the notion that any age is the right age to wear a brooch if one feels like it. I love the idea of wearing them in the hair or on a hat, or attached to one's purse, as well as on jackets, coats, blazers, and dresses. You are not such an old biddy, Julia. Go Kate. Wear those brooches. Don't let Julia be the only one on that side of our pond. Hats are the strongest points of Kate's look. They change an ordinary garment into something extraordinary. But this coat is gorgeous. Happy Christmas from Poland especially for those who feel lonely. I'm sending you my best wishes. Justyna, Thank you. That was very thoughtful. Lovely, Justyna, and I join you with those wishes. We are blessed to be with family this year, and a Happy Christmas to all. She is absolutely beautiful, even though i thought she would due a repeat I love this. I don't know about the rest of you all, but when i see pics like today with Harry walking with William and Kate, it looks incomplete. Maybe one day Harry will find a wife, and then everything will be complete. Even though i love this outfit, i would love to see the coat she were for her first Christmas as DOC. That was very festive. And yeah one day too, we will have another Duchess of something. Charlotte, a very merry Christmas to you and your family. And thank you so much for this happy post. So much for speculation over a recycled coat! :) Kate looked wonderful from head to toe. Always nice to see this couple together...happy and enjoying each other. And how nice that the Queen extended the invitation to the Middleton's. Merry Christmas to everyone who is celebrating! Hi, Charlotte. I don't think that Kate is wearing the same dress as in 2013. I mean it's the same dress but with different colouring. I wasn't sure if you'd noticed that or not.☺ BTW, I absolutely love her new coat. I thought she was wearing a Saint Patrick's Day repeat, but I'm actually glad she has a new coat. She looked beautiful today, one of her best outfits for me this year for sure! Thank you so much for all you do Charlotte. Merry Christmas and Happy New Year! Yes, I think it's Princess Margaret's children and grandchildren. I thought the last shot was Sophie and Edward, The Queen's youngest son and their two children, James and Lady Louise. It's a handsome looking group, indeed. And that's a nice brooch. Other than NZ, I don't think I remember her wearing a brooch on a coat before. She should do it more often. Another good observation Rebecca. That makes sense. Perhaps when William is king, if they are still doing the walk, the Middletons will be included in the walk. That wouldn't surprise me. Until then she sends love and greetings to her cherished family by wearing the brooch. Sweet. And one of those "Kate things" for sure. I think Kate needs to develop her own sense of whimsy. She's sort of constricted in what she can wear professionally, so I would really love to see some playful touches somewhere. She could put a pin on one of those flying saucer hats she wears. The one I really remember was that red pillpox looking one when they landed in NZ. With all the buttons on that red coat, the hat was just screaming to have that fern brooch pinned to it! She wore a large pearl brooch on the ice-blue McQueen suit she wore to Trooping the Color in June 2014. 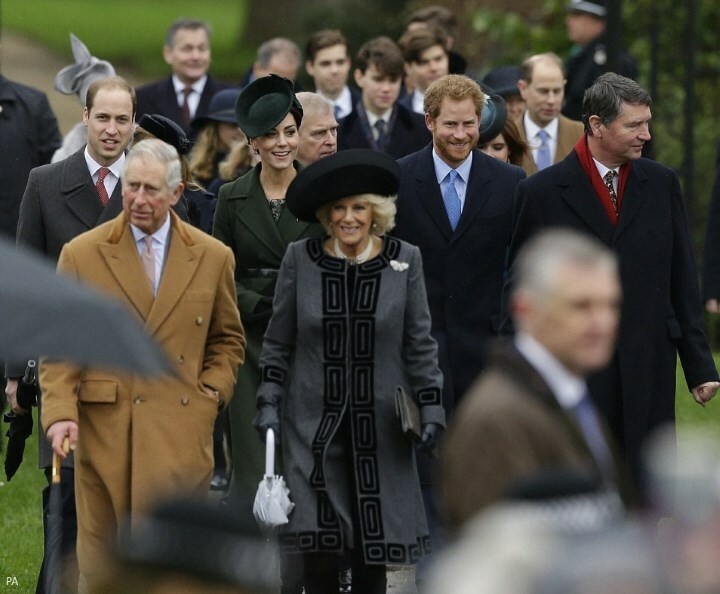 As for the Middletons being included in the Christmas morning walk to the church - why? Camilla is married to the heir and her family (children and grandchildren) aren't included. Besides, I expect that a lot of these traditions that are in place now will likely be done away with once Charles becomes king. The only glue that is holding the whole family together is the queen and the Duke of Edinburgh. Charles's brothers and sister loathe him for his attempts to strip them of their personal security details, to reduce the royal perks of themselves and their families (while adding to the perks of himself and his children) and to essentially make the "senior royals," himself, his sons and their spouses. Anne is a grandparent, Edward has young children and Andrew always looks like he's peeved that he has to be there at all. All the rest of the Sandringham group are either very old or very distant relations. I don't expect that there will be any rush to spend Christmas at Sandringham once the queen and the Duke of Edinburgh are gone. Vintage looks very good on Kate; she can carry it off. I recall the first example when she attended a wedding as William's g/f. A very different look for a young woman her age, but it worked! And I agree with bluhare regarding brooches...you can be quite creative with them. Regarding the Middleton's walking to church on Christmas Day...I wouldn't object to it (there's no negative history there), but I don't see it happening. But it will be interesting to see if Camilla's family does so when she is queen. I believe a lot will depend on the response to her being crowed at Charles' side. I don't know about loathing. I think Charles and Anne used to be quite close, which is probably related to the fact that they're closer to one another in age than to Andrew & Edward; and Charles is even said to have chosen her daughter's name, Zara. And I think she's never been too keen on royal perks for her children, since they could have been given titles, had she wanted them. So I really don't think there's much trouble between those two. With Edward and Andrew - possibly. I actually think Kate does have a sense of whimsey and has expressed that at times in her clothes - recall those sailboats. Brooches are an excellent way to add whimsey - or just character - to send a message as Kate may have been doing to her family that she is thinking of them - I love following the queen's brooches and hope someone will write a book just on them someday. Of course things will change when Charles is king. Perhaps Christmas will be at his beloved Highgrove and the walk from there. One forgets because the Queen has been queen for so long how innovative she has been. A lot of firsts chalked up to her. Just as our families evolve so to does the royal family. It will be interesting to watch the evolution. If Camilla's family makes the walk then no problem for the Middletons when William is king. If some traditions are done away with it follows that some also could be altered and that includes including the Middletons in the walk. I'm not sure exactly when the tradition changed, but back in the 1980's Christmas was celebrated at Windsor Castle, with New Year's (and the remaining weeks of holiday) spent at Sandringham. GREAT points alimai. never thought of it that way, nor did I realize the Queen had changed some things up like she did. Here's the thing. If I'm going to make the effort to watch them walk in and out of church, it's going to be to see the royals, not the in laws. No disrespect intended to any of them, but I wouldn't be watching to see the Shands, Parker-Bowles, Middletons, Tindalls, or Rhys Jones'. It's not just another day at church; it's more formal than that, and it's for the royal family. The same goes for any other royal event. It's about the royals, not their in-laws. Now, what they do with their own families in their own homes is their business. Her Majesty is beautiful! So regal and happy! She must be thrilled having all of her family there with her. Merry Christmas everyone!!!!! must mean the world to her. Hopefully this will be a turn-around year for him. Thanks so much for taking the time to update your blog on Xmas day. Catherine and William were the picture of happiness - their love for each other radiated and added a sparkle to the whole congregation who all seemed so serene and grateful! Catherine was absolutely gorgeous with her hair up and her lovely new coat! I concur a very fitting colour for the holiday season!!! As for her Majesty, she was stunning in her red coat and hat trimmed with chinchilla. A regal outfit for the most regal of all!!! My heartfelt wishes to everyone for a very Merry Christmas and a Peaceful, Prosperous and Happy New Year!!! I was thinking it might be a Green Coat and New Hat Christmas for Kate, but was expecting a St Pat's Day coat recycle. Nice surprise with the new coat. Still, I think Queen Elizabeth's ensemble is the Big Winner in the Royal Fashion Derby. The Princess Royal, for a change, was wearing a striking and attractive outfit, if you subtract the chunky purse. Merry Christmas! I agree with zipzipzippy. I loved the Queen's outfit. She looked radiant. Merry Christmas to all, a special Merry to you Charlotte, and your husband. I love Kate's outfit today. I thought she looked splendid, just perfect. Also, I thought Camilla looked lovely too. I loved her coat. Looking forward to more fun next year. Queen Elizabeth looked wonderful too. She is amazing, and so is Prince Philip. Wonderful to see them all, but especially beautiful Kate. Charlotte, love the Merry wreath at the bottom of the page. I wouldn't want to see Kate in fur but I do think the queen looks wonderful - in fact, the whole family looks wonderful - must run off on family duties now - but it's so nice to see the whole family together. I guess the Queen is wearing real chinchilla. Kate would look good (and a lot warmer) in faux fur though. Green looks very good on Kate. Only Harry stopped and chatted with the crowd, I am little disapointed about others. This is not true. 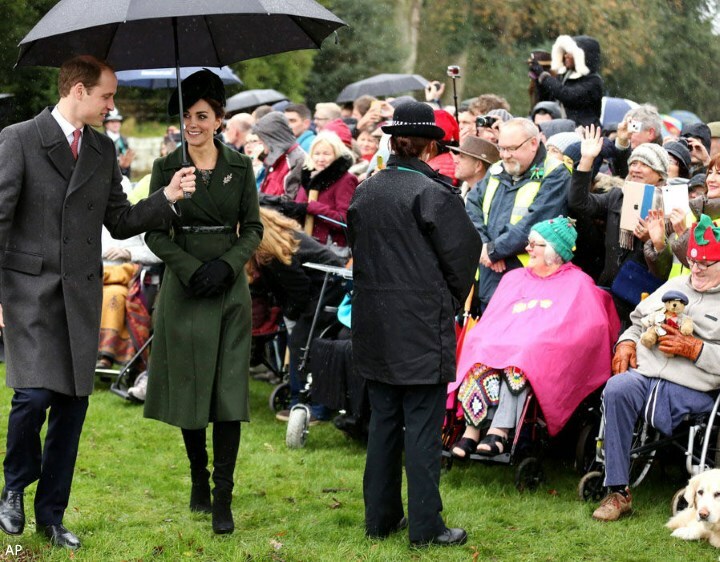 William, Kate and Harry all went to the crowd. In fact William and Kate went first. Sky reports that only the young ones did but I saw Camilla do it briefly as well. Kate looks great, but to me this coat is a different version of almost every other coat that we wears. There is nothing that different or stylish about it. I think Sophie's outfit looks so sophisticated, I wish Kate would break out of the mold sometimes with something different. Also, think Camilla does a great job and always looks good. I think Camilla definitely has had some good style moments. She has improved. The coat today though was not cut properly. It was too loose, boxy and shapeless and the neckline wasn't flattering on her. I thought Anne walking next to her father was very sweet. Was Andrew there today? In thinking about their day, I wonder what they have for breakfast at Sandringham on Christmas morning? And, I hope we get photos of the Middletons at the pheasant shoot. We haven't seen Michael in awhile so I hope they get some photos of him included. Happy Christmas to you, too, Charlotte, and thank you for a lovely year at Duchess Kate! So glad they are spending the day with the Queen and Phillip. Perfect solution for this year, invite the Middleton's to the pheasant shoot. Most sincere Christmas Greetings to all. Yes I did notice the Princess Royal's coat. One of my favorite shades of green. That coat was lovely. I would wear a coat that style and color gladly. When have I ever said that about Anne's clothes? lol. The hat however is not my favorite. Style choices say a lot about a person. In the past I have tried to understand what Anne is saying with her choices and why, but with a lot of frustration concerning that, I still haven't got a clue. yep. The Queen definitely looked like "she knew she was stylin' ". The "belle of the ball" indeed. Nice that you noticed that tie in, future and past represented by the photos. I am sure the Queen misses her mom a lot, (and her sister also). They were all three very close. Merry Christmas to you all! Lovely post! I think I see a necklace around Kate's neck? I can see the chain but it's hard to ID the charm because it's laying against the busy print of the dress. I think it is actually under the dress. Maybe something personal and not for decoration. And that's why its under the dress? The highlight for me today was the Queen's Christmas message. It was wonderful to see the royal family together today, but unlike Camilla Tominey's article, it looks as if the family attendance is smaller this year with most of Princess Anne's family missing. The post is updated with additional photos of William and Kate chatting with the crowd (photos were quite slow coming through some agencies) and I've added The Queen's Christmas speech. It was wonderful as always. Thanks so much, Charlotte, for your usual wonderful blog post! 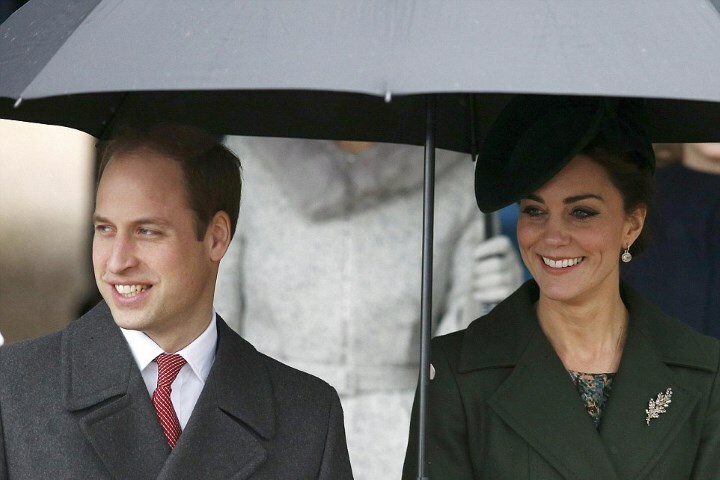 I love seeing William & Catherine together, and they both looked so happy this morning. :o) HM was stunning in red! Happy Christmas and God bless Charlotte and all who follow this great blog! LOVED Kate's look today! This is probably my favorite Christmas outfit she has worn. The hair was elegant, the hat...LOVED IT!, and the coat, very seasonally appropriate. Merry Christmas everyone and especially our NEWLYWED and her first Christmas as married! Kisses Charlotte! We usually call this a pointsetta. A very beautiful Christmas Plant. Kate did it again with her symbolism. Good eye Rebecca. yep. That and the brooch. Rebecca, it was my first thought! The Queen's speech was so uplifting. Light does overcome darkness. Love never fails. Hoping we can, each one of us, find that light and let our light brighten every inch of our sphere of influence. It is doable and necessary, even though not always easy. The choice is ours from moment to moment. 16:59, That is the goal. Hopefully. Thanks for the encouragement. Peace really does begin with each individual with our every word, thought and action. We can do it. The belt does look quite high up but if you look at it in the Farfetch pictures it is meant to be worn that way just under the bottom of the collar and Catherine is quite high waisted anyway. I think it suited her very well and was well accessorised. No doubt it is warm indoors at Sandringham House so no need to wear very warm clothes underneath it. I'm with you Rebecca...cold and drafty is all I have ever read about Sandringham or Balmoral. I cannot recall where, but I even read that the Queen sleeps with her windows open while the snow is drifting in. Brrrr!! Is that Sandringham or Balmoral? I have heard more than once I think that Balmoral is cold and drafty but I don't recall having heard that about Sandringham, although it would surprise me if it wasn't also cold and drafty being as old and large as it also is. I tried posting this on an earlier thread more appropriate to the date, but didn't see it there among the hundreds of comments. Here it is again. It was there and got quite a few responses. Thank you so much. This is lovely. Clever woman. Thank you, Rebecca. As you pointed out, it was under the "Load More" line--which I had to click several times to find. And no, it took a little more than 10 minutes, Lacey; however, it was one of those moments when it was effortless. Great fun! After that I did work at refining the DRAFT before choosing to post it. Thank you to those who offered their appreciation. Like brooches, rhymed verse is very old-fashioned nowadays. Or rhymes must be more hidden and sophisticated. But like finger-painting, it provides a great deal of not-at-all-serious pleasure just mucking about. You'd think "free verse" would be easier, but no. For that you have to leave blood on the page. How clever and fun. Loved it. Thank you. And I too have trouble when the comments get above 200/250, the "load more" never seems to end. The Duchess looked fabulous: I especially liked the hat. I also noticed that her lips are more defined and that she is not wearing her "signature" pink lip gloss but one that is more pigmented? Yep, I'm glad other people noticed it too. I thought at first maybe the lighting affected her lip color. I think she did use a new lipstick. If you look at the photo of her wearing the burgundy coat, her lipstick color is lighter in that photo. How does the morning work for the Royals and Church. Are there two Church services in the morning that everyone attends? It looked like pictures from different services on some of the sites. Thank you to atone who knows. It's one private one earlier in the morning (which William and Kate have skipped now when the kids are small) and then there's the official christmas walk, hat on, service as well. The first one is probably the more "spirutally important" (Especially for the queen) while the other one is for the publics sake. Or so I see it. I just have to say that I have been a fan of this blog for a while now and this is my first comment. I love the coat and hat, she looked really nice today. My next question is a little off topic but, when Harry marries, will his wife be a duchess or a countess. I'm an american so I'm not sure how it all goes. Thanks Rebecca. It does seem quite confusing because some call Kate princess, and some call her duchess. I did read some where that the queen has reserved the title of Duke of Sussex for Harry, but that was the Mirror so i dont how reliable they are. I also wonder will she be compred to Diana like Kate has. I'm not British but I read that Prince Edward is an Earl because he will be inheriting the title Duke of Edinburgh in the future. Probably will be getting a lot of Prince Phillip's charities which are numerous. Maybe that's why the Duchess has relatively few because there will be so much to take over in the future. I think she's wearing a different belt from the stock picture. Love the outfit, good to get something new. Happy Christmas! I did not know this either so I am glad someone asked! And thank you for your answer as well Rebecca. Merry Christmas! Please correct me if I'm wrong on any of this, but I heard a rumor years ago that Prince Harry will be made Duke of Sussex when he marries. My understanding is that Prince Edward chose the title Earl of Wessex after watching the movie Shakespeare in Love, but that Prince Edward will eventually be made Duke of Edinburgh (currently his father's title) after the title reverts to the Crown (after the current Duke's death and when Charles become King). Hope this helps. Yes, it's very very likely that Harry will get a dukedom when he marries. Edward was made an Earl (making his wife a Countess) but that's because he's the third-born son. There are a limited number of dukedoms still available, so Harry will most likely be made Duke of Sussex (or possibly Duke of Clarence but Sussex seems to be more likely). That means his wife will either be the Duchess of Sussex or the Duchess of Clarence. That is, unfortunately, true about Andrew. He almost always looks so aggravated and perturbed. He looks a little pale of late also. I pray he is okay and that things change for him so he can enjoy a happy life. I believe in miracles. Thanks everyone for your thoughts, and answers. My first comment was the Anon 18:58, I didn't know that I could write my name. But I'm Delicia. I look forward to 2016. And seeing what activities Kate will do. And look forward to commenting more on the blog. Thank you for the photos, Charlotte. It's always so nice to see the Royal family together for Christmas. The Duchess looked very elegant today, although it seems like the belt of her coat was a little too high. But my favorite outfits of the day were the Queen's and Sophie's! The Queen's was so festive and cozy, and Sophie's was so elegant. Loved this whole look. Loved her hair (must be a bit easier to put up being a bit shorter), the hat. Just looked great overall. Charlotte I hope you have a wonderful festive season and best wishes to you and your family for 2016. You do a wondeful job with this post and even though I do not always post comments, I do always check in to see what is happening. I adore the Queen in red and really liked all outfits worn by the extended family, particularly Anne’s coat. But what is happening to the world, the Queen without a brooch and Kate wearing one! I like Kate’s coat and she’s got quite a collection of green coats for Saint Patrick’s day now. Love her hat, hair and jewelry today. I love this coat. The Duchess looked absolutely beautiful today. I would love to see her wearing again the coat she wore in 2011 too but i loved this one as well. I don't know what to think about wearing brooches, i've never worn one but I think they are lovely on Kate. I can't wait to see George and Charlotte walking among them in occasions just like this but i know we have to wait years. It was the first time today for James, Viscount Severn and he's 8.. Yes there are 2 services. One early and private - this is a Communion Service. Usually low key - in fact it is only in recent yrs that photographs have been taken. Then the service that is well-known - more formal,(with hats). So today HMQ wore her old fur at the first and red at the 2nd. Sophie wore a navy(?) coat at the first and pale grey at the 2nd. Thank you very much Charlotte, for your great work! I am French, and I love your royal family and well on your blog! Merry christmas to you! Merry Christmas all!! The Duchess looked fabulous today and I really liked her the new green coat. She looked happy and well-rested. It is always nice to see all of the Royals on Christmas Day! Thank you for the wonderful posts again this year Charlotte. Kate looks gorgeous from head to toe love her hair and hat everything and earrings! The Duchess looks very beautiful! A very special wish for holiday joy to Charlotte and your new husband! Have to agree with Nicole! I was very disappointed. This looks like every other green coat she's worn on St. Patrick's Day, and it doesn't even seem to fit very well as the belt is so high. Anyway, Merry Christmas everyone! Thank you Charlotte for taking time from your Christmas to post. 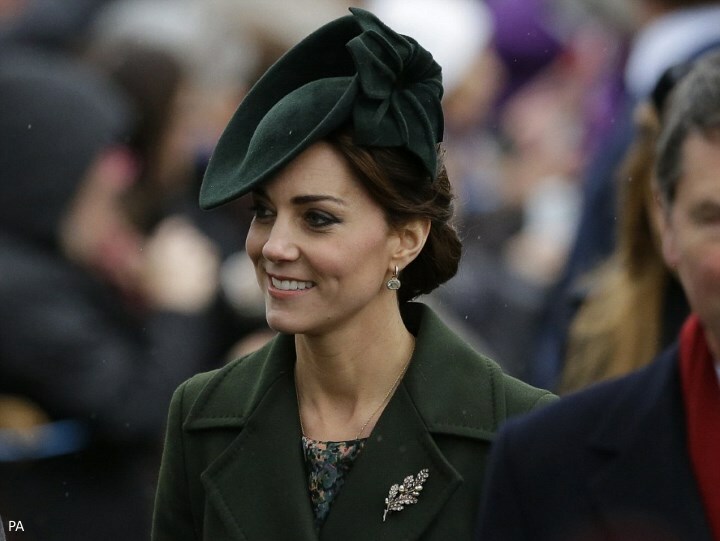 I loved the Duchess of Cambridge's hat today and look forward to seeing it again (maybe for St. Patrick's Day?). I agree that I'd like to see the Cezanne dress (either color scheme) in it's entirety. Merry Christmas to all! 1. THE QUEEN stole the show, by far. She is absolutely stunning today, and by the look on her face, I think she secretly knows it. WOW was my first reaction. 2. Kate: I love the color of her coat, but the style and what she has under it, are just meh. Nothing different than what she has worn many times before. The belt seems too high waisted (a la Michelle Obama..lord knows I adore her but her belts were always up to her bust line). Also I don't care for the low necked flimsy looking dress under the coat. In winter I would like to see something more high necked and substantial. Love her hair and hat though. 3. The York sisters, for once both look great at the same time. They look maturely dressed with no faux pas with outlandish clothes or hats. 4. Sophie looks more fashionable and sophisticated than Kate. Love her choice of coat today. And her daughter is dressed age appropriate for a Pre teen, not like a 6 year old like in the past. 5. Princess Anne does NOT look dowdy! I am pleasantly pleased. Her coat is just fine.. But dear lord her hat looks like it was purchased at an open air straw market, Christmas ribbon tied around it, and a goose feather picked up from a field stuck in. 6. William wins the menswear category, in GRAY, not his normal navy. Plus he stands out over all the other men in their camel hair. Yes, the Queen and her guests attend early communion quietly, and after breakfast they dress up, and most of them walk to the later aervice. I think visitors along the path are allowed only at the second service. Thanks for the post, so quickly after they visited the church! Do we know if George and Charlotte were there? Merry Christmas and a very happy new year to you. I so enjoy reading about the royal family, so I thank you for the time you give to this blog to keep us all informed. I look forward to what Prince William and Kate will be doing in the coming year and seeing their darling children as they grow. Thank you for the post Charlotte! The Royal Family looked so happy--lovely. 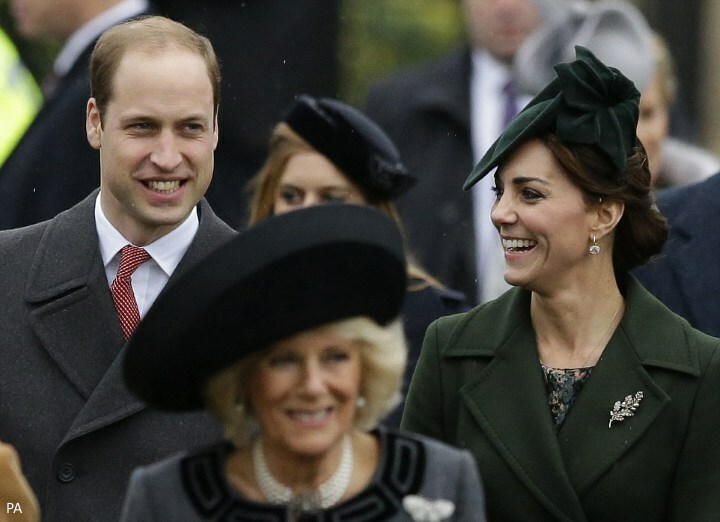 I thought Kate's coat was odd with the high waist but the happiness on her and William's faces are what counted. Thank you Charlotte as always for your amazing posts! I truly look forward to them! Merry Christmas! Thank you Charolotte, love this blog! Loved Kate's look today. Any idea hoe that belt works? Does it buckle in the back? Lady Louise is actually dressed like a preteen. Hooray. Her eyes looked like they might be regressing a little. Time to pray. I noticed that too, Anon. For years I've wondered why she was being dressed like a toddler. There are so many great pre-teen fashions she might enjoy. I was looking at a family album recently and enjoyed remembering the numerous lovely clothes I wore as a young girl. After age six my mother allowed me to choose my own clothes. Because we lived in the country, these were ordered from the much anticipated Eaton's catalogue pages Mother pre-selected according to her price-range. I would hope that Lady Louise, since she has more means than my parents did, might enjoy similar pleasures. Then again, maybe her parents don't want her becoming a frivolous, clothes-obsessed person or following the path of her cousins. Still, it's possible to adore fashion without being a ditzy bird about it. Or having to dress like you are six when you are twelve. are those white topaz in Kate's brooch or diamonds? It doesn't seem to sparkle like diamonds. I wish she had worn a thinner, colorful scarf around her neck and tucked into the coat. She's looks cold with the exposed areas and the thin dress. The color of green that it is it needed some color. I think the hat needed some embellishment also. Happy no one outshines the Queen in the church appearance. True, Rebecca. Hopefully, someone, somehow, can get us more information on the brooch. Wouldn't it be amazing if that was a Christmas gift from the Queen (to sort of pique Kate's interest in wearing brooches by showing her how communicative they can be.) The Queen no doubt wants all her brooches to continue to be worn by the future generations and not just kept in a vault for years. 1.The coat is a little bit too long. It makes her looks older. The right length is knee length. 2. The nicest hat is that of Beatrice. Beautiful heat indeed, I love it. Interesting to look for the acorn's meanings: there are many sites with great information on the internet, here a quotation from one of them. "The acorn is the fruit of the oak tree and has long been a sacred tree to many different cultures, and the acorn was known as the sacred first food of mankind. It is a symbol of security and abundance. An acorn carried on one’s person counteracts loneliness, illness, and pain, aids longevity, brings luck, and preserves youthfulness. Acorns will increase fertility, whether this be in matters if the mind and ideas or in reproductive matters. Acorns are often a talisman against lighting, especially when kept on a windowsill. This is why window blind pulls were often shaped like acorns. If gathered by the full moon, the acorns make good faerie talismans, as the fey have a love for oak. To plant an acorn under the light of the moon is to bring luck and prosperity to you." Here in the U.S. the "mighty" stands for strength and stability. The acorn would convey those attributes to any progeny. funnily I have noticed that Sophie had some troubles getting up the stairs to enter the church .... skirt too tight ? Uhmmm... i dont want to interrupt but the green of the hat and coat don't match... (!). It hurts my eyes! Just cant believe someone with such a enormous coat and hat collection makes this choice. Dont care for this new coat which looks like at least 20 other coats she owns. Also: brooch, print dress, earrings AND necklace? The Duchess and I sometimes have very different taste haha. Despite all this, she looks still incredibly beautiful and graceful I must say. Very happy and content also, a bit tired maybe. the true color of the pieces. I think see looks wonderful as always. They both seem so happy. Very nice hat and updo. I love her shorter hair, because it is still long enough to wear up for an elegant look. Kate is wearing a gold necklace with a delicate chain. I think this might be a new piece, maybe a Christmas present? I hope all who celebrate Christmas had a wonderful holiday with their family and friends! I will probably ruffle a couple feathers here but I have to agree with the posters who thought the DoC's outfit bordered on the dull and drab. The coat is a VERY dark green and there is a lot of it all topped of with a hat of the same color. At first I couldn't even tell it was a green and I was tryung to discern if she was wearing brown or grey. Not at all intetesting was my first thought. 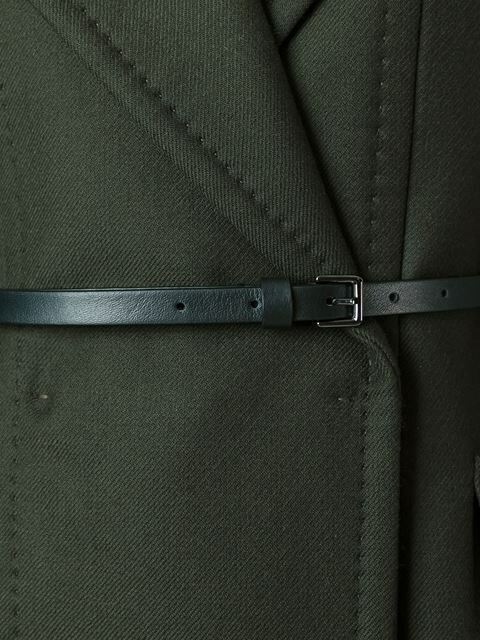 the color screams vintage military apparel to me. both sophisticated and interesting. Nice to see Lady Louise too. I think she finally took the reins and had some say in what she wore :-) Adorable outfit! PS Charlotte. Thank you for all you do! I love the sparkling wreath:-) It makes me happy. It really brightened my day also Charlotte. Add me in to the Fans of the Wreath crowd! Happy Christmas to all. (And to any non-Christmas observers blessings on your holiday or just blessings in general.) Kate looks wonderful - love her in that coat. A while back someone (Erika? Claudia - my memory is so faulty) recalled with me a photo of Diana with a man at a deaf centre. She was wearing a green velvet suit and a hat very much like Kate - tipped with a bow at the back - I love the hat on Kate, nd it reminds me so much of that beautiful hat on Diana. A great look and the brooch for me -- really makes the outfit. Sounds like they've achieved an excellent compromise with the Middletons too. I usually stick with the "as long as she looks nice and appropriate" line, which she does, but I tend to agree with you Erika. The outfit was nice but not "wow"! I actually thought it looked like a maternity coat she wore toward the end of her second pregnancy, it was navy and I think had a similar cut? I don't have the fashion eye or memory you all have, so maybe I'm wrong. But to the point Barbara also made, a lot of her clothes are really very similar styles so can look repetitive. Obviously beauty is in the eye of the beholder! But I think it comes down to what you like and expect, I liked the dramatic flair Diana had for clothes (I see it in Maxima as well) though some people see that as "costumey" which I understand. A lot of you talk about Kate's wardrobe from 2011/2012, I wasn't watching her really then, certainly not closely, but I went back to look and absolutely agree, some fantastic "wow" outfits. First of all, thank you Charlotte for the marvellous posts you come up with every time. Especially this time of the year. I agree with lots of sentiments. I loved her hat, brooch, even the dress. But the coat with this belt did nothing to her. It was too simple and bland and like the 5th same green coat. Never mind, she can't always choose well. Great speech by the way. I wish all of you a very happy new year!!! Merry Christmas to all! Before I comment on Kate, I must say HM looks absolutely beautiful! The red is so striking and her smile says it all. She is stunning! Kate looks beautiful as well! Loved her coat and really loved her updo and hat. She and William look so happy. I know they enjoyed celebrating with George and Charlotte and seeing the magic of Christmas through their eyes. Enjoyed seeing the family walking to church and hope they all enjoyed the festivities at Sandringham. Lovely day! Thank you sweet Charlotte for the lovely post on Christmas Day! You always work so hard keeping the blog up and I am grateful for all you do! I hope you enjoyed your Christmas and are able to relax a bit. Happy Christmas to you and yours! Looking forward to a fabulous 2016 on the blog! Charlotte, I want to take a moment to thank you for this wonderful blog. There are many great blogs out there on Kate, and I read a lot of them. But none of them have the place in my heart this one does. It is the first place I go for news about Kate. If I see a new post here, I save it as kind of treat for myself & read it with a cup of tea & so much pleasure. The writing is perfectly charming & the research is impeccable. I am so thankful for this blog, Charlotte! It truly is life-enhancing. Thank you & enjoy the rest of the holiday season! Thanks for the photos and for the Christmas message of HM. I really enjoyed watching it, she is such an inspiration. I also loved the boys' singing at the end. Great job, just 10 kids and such wonderful music! Any guesses as to whether the brooch is diamond, paste or topaz? Thanks for the photos and for the Christmas message of HM. I really enjoyed watching it, she is such an inspiration. I also loved the boys' singing at the end of the video. Great job - just 10 kids and such wonderful music! I really enjoyed the photos, as well as watching the Christmas message of HM. She is such an inspiration! I also loved the boys' singing at the end of the video - just 10 kids and such wonderful music! Kate looks nice and happy so all in all, can't complain. I do agree with everyone that this look is a little drab and boring - last year I didn't necessarily like the colors she chose for Christmas, but I did think she looked very sophisticated and put together - that scarf she had really pulled the outfit together and it was a different look for her which was nice. This coat is almost completely interchangeable with many of her other coats, and is such a full green that it really could have used a scarf to add some color. The unfortunate thing is the cost IS different from some of her others by having such a high belt but I just don't like the high belt at all. I do think it would have looked better with the original belt. Those boots are also looking faded - she needs to get a new pair for engagements next year or do something to make them less faded but they are well used and a few years old so I wouldn't be shocked if they just need to be thrown away. Also...is it just me or does the coat seem to fit Kate quite differently from the model? Kate has her belt right under her breasts just like the model, but the model has several inches between the belt and the pockets, whereas Kate's pockets are right under the belt. It also seems to have a bit more of a flared skirt in the bottom part on the model, whereas Kate's coat appears more straight. I wonder if she got a customized version? Lastly, happy holidays to everyone! I wish you all happiness and joy for the rest of your 2015 and onwards. Thank you, Charlotte, maintaining such a wonderful blog, even during the holidays. Have photos of the Middletons emerged from the pheasant shoot? I hope we see her again soon! For me, this is not her best coat. She owns so many and this color does nothing for me. She always looks lovely, but I would have preferred a brighter coat. Her Majesty looked fabulous in her red. I saw Kate today's Sunday service! She looked lovely! !